These two craftsmen styled set of windows was purchased from an antique dealer. They were to be installed in a new residence. There were only two broken pieces of glass which were barely noticeable. My job was to clean and polish the windows without removing the patina that the zinc had acquired over the years. One really unique feature of these windows was that the zinc had been copper plated. Many of the older zinc windows were copper plated as to keep the zinc from reacting with the atmosphere. This is a close up of the artistic detail which defines the window. 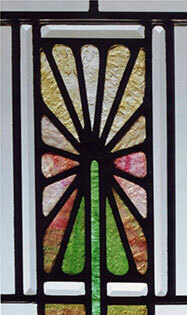 The artwork depicts a stylized flower. Note the linear green stem and triangular shaped green leaves.